I’m sorry I’ve been away for this past month, but I was writing. Just not here. I went out with a pitch and a spec pilot and a book proposal so there’s lots of “me” that is currently “out there,” which took time away from right here. Actually… just blame Twitter. First, I need to remind the people of Athens, Georgia, that I’m fixin’ to come round your parts (dirty!). Join me and the Classic City Rollergirls for a weekend of books, beer and bruises. September 17th, 7pm at Borders, I’ll be reading and signing with special guests from CCRG. Then, Saturday night, Classic City takes on Chattanooga as I’m making a fool out of myself in the announcers booth with a man named — I’M NOT KIDDING — Sweet Willy T-Bag. “The Chattanooga Choo Choo is coming to Athens for a Loco Mow Down! This is train wreck you don’t wanna miss!” The action begins at 7pm (doors open at 6pm) at Skate Around USA, 3030 Cherokee Road, in Athens. Roller Derby is family friendly so bring the kids! Admission at the door is $10 for adults, $5 for children 6-10, and children under 6 are free! More info on this weekend (including ticket sales) can be found at http://www.classiccityrollergirls.com. Next: IT’S DEWEY DONATION SYSTEM TIME! We’re working behind the scenes to bring you a fancy new book drive Tuesday! That’s next week! Tell your friends! Grab your credit card! Get ready for the tears that come from making public libraries get books! You guys, how cool is that?! So with Dewey gearing up, there will be lots of pamie.com updates in the next couple of weeks. 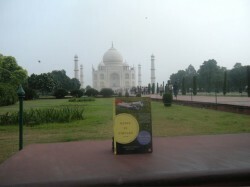 Sorry I was so sporadic, but books don’t end up at the Taj Mahal all by themselves, you know. Previous Article Sometimes My Cat Likes to Stand on My Neck. Next Article Guess What? Dewey’s Back!